Melt the butter in a skillet over medium heat. Stir in the carrots and cashews, and cook until carrots are tender and cashews are golden brown. Mix in the honey. In a bowl, beat together the eggs, heavy cream, nutmeg, and salt. Evenly spread the cheese in the bottom of the pie crust. 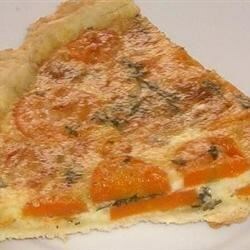 Layer the carrot mixture over the cheese, and top with the egg mixture. Bake 40 minutes in the preheated oven, until a toothpick inserted in the center comes out clean. Simply nice, so very, very nice. I loved it and thought a nice salad would have been so nice with this nice quiche. But alas, only crude cupboard items were at hand - what a pity! Fantastic recipe but I decreased butter to 1 tablespoon; crushed the cashews; decreased honey to 1/4 cup and changed heavy cream to milk and only used 1 cup.